Over 3,700 costumes and accessories (hats, shawls, gloves, undergarments) form an outstanding collection of men and women’s clothing including, military uniforms from the War of 1812 to the Vietnam War. Perhaps most famous is the uniform worn by Captain James Lawrence of War of 1812, “Don’t give up the Ship” fame. Famous Paris fashion house Worth dresses, wedding outfits, and silk dresses provide examples not just of the life of the well to do but of local technology and workmanship. The Historical Society’s collection is especially noted for its representation of every-day life—clothing not usually donated to museum collections but worn and then discarded. The Historical Society has everyday breeches and coats, cotton-printed dresses from the 1820s, smocks and dresses from a 19th-century Newark orphanage, and nurses’ uniforms from every decade since the early 1880s. Some outfits, such as Mrs. Thomas Edison’s salmon silk skirt and bodice worn at the 1889 Paris Exposition, give context to the lives of New Jersey’s famous personalities, and cotton detachable pockets demonstrate early answers to washing challenges! 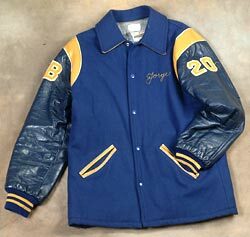 The donor was presented this jacket as a member of the St. Joseph’s football team of the Palisades High School, West New York, New Jersey. Their team won the Hudson County and New Jersey state football championships for the 1974 season. Purse by Alvan Anglin, New Brunswick, New Jersey, 1994. 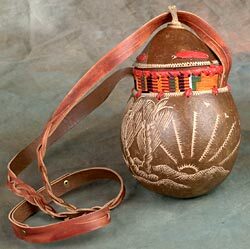 Artist Alvan Anglin made the calabash gourd handbag from Jamaican products. It is decorated with a Jamaican scene of sun and trees. Anglin began his traditional Jamaican crafts on his native island, and then moved to New Jersey in the 1990s. 2 Capias by Milca Irizarry, Kearny, New Jersey, 1991-1994. Gift of Milca Irizary. 1995.30. These small corsages, called capias, are festival mementos that evolved from 18th century Spain. In the Spanish-speaking Caribbean, the rite was transformed into a secular custom to prepare the bride for her wedding, and capias became part of her dowry. 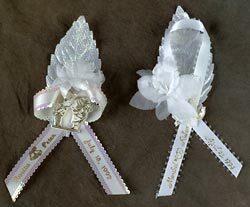 According to tradition, brides pin capias on wedding guests. Woman’s bathing suit, about 1900. This is part of a two-piece bathing costume typically worn by women at The New Jersey shore beaches in the early 20th century. 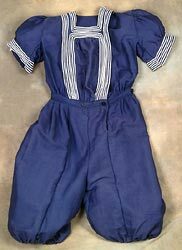 The costume consisted of bloomer-style legs, squared neckline, and puffed short sleeves. An outer skirt was then worn over the legs. Wool, metal, plastic, synthetic fabric lining, felt, cotton. 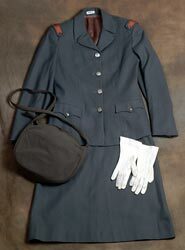 The jacket, skirt, purse, and gloves were part of the uniform worn by the donor as a member of the United States Cadet Nurses Corps during World War II. She participated in the corps as a student at the Orange (New Jersey) Memorial Hospital School of Nursing. In return for a government stipend and tuition, the student agreed to serve a three-year period in the Armed Forces.